This paper presents detection of human faces in a color image. The detection is based on a skin-color model represented by a Gaussian model. We compare 12 different skin-color models that vary in aspects of color representation� of a pixel (RGB, HSV, HSL), complexity of Gaussian model and character of an input image set. We present all steps of the image processing and some assumptions to optimise the results. Finally, conclusions are presented and future work is outlined. In the past decade, face detection has become an often researched problem. 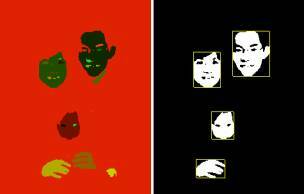 It is the primary step of other tasks such as face tracking in color video sequences or recognition of facial features. This research area has many applications in face identification systems, model-based coding, gaze detection, teleconferencing, augmented reality, etc. It also helps to solve the idea of simple human-computer interaction and communication . The face detection systems have to detect every human face in an input image, no matter the lighting conditions or race of people in the image. These systems are usually based on an experimentally estimated skin-color model. Skin-color model uses an idea that color distribution of skin-color of different people is clustered in a small area of chromatic space. The main goal of our work is create a face detection system by using a statistical skin-color model represented by Gaussian model.� We will analyze 12 different skin-color models that vary in aspects of color representation� of a pixel (RGB, HSV, HSL), complexity of Gaussian model and character of an input image set. In Section 2, we describe the present state of methods used in the area. In Section 3, we discuss difficulties and describe techniques which we subsequently developed to overcome them. Finally, in Section 4, we present the results of our experiments. The normalized blue color is redundant because �r + b + g = 1. 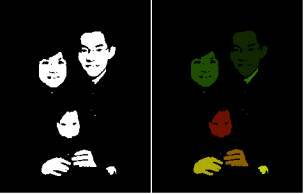 Skin colors of different people appear to vary over a wide range, they differ much less in color than in brightness . So, the colors of human skin fit in a small area of chromatic color space. In the following section, we describe the process of estimation of our skin-color model. We collected two sets of 15 color images each with human faces from the World Wide Web. 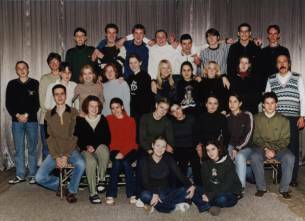 First set are images of people with white colored skin (Caucasian and a part of Asian race), second set of people with brown and black colored skin (African and� a part of Asian race). Than we� manually selected little rectangle samples of skin from every image of each set. These samples were filtered using a low-pass filter to reduce the effect of noise. Then we counted normalized values of red and green color for each pixel of filtered samples (formulas 1, 2). where x = ( r g ), m is mean vector, C is covariance matrix. So, finding an appropriate skin-color model depends on estimating right parameters of Gaussian model. The main aim of our project was to compare� processing of images with different skin-color models. As was said in the beginning of this section, we had two sets of color images. So we could create three sets for analyzing: one set of people with white skins (Set W), second set of people with black (Set B) and brown skins and third set as an union of first and second set (Set WB). We used following color representation of a pixel in our experiments: (normalized) RGB, HSV and HSL. Estimating parameters of skin-color model using HSV and HSL model is similar to the (normalized) RGB model. The main difference was that every component of HSV representation (h,s,v) was relevant, so the mean vector and covariance matrix of Gaussian model were�� 3-D. 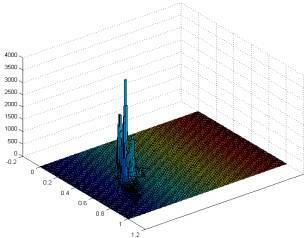 The complexity of Gaussian model divides models in two basic types � single Gaussian model� and mixture Gaussian model. The parameters of mixture Gaussian can be estimated by means of the Expectation-Maximization (EM) algorithm . where x = ( r g ), NW(m,C)�� is Gaussian model of Set W, NB(m,C) is Gaussian model of Set B, NWB(m,C) is Gaussian model of Set WB. Accordingly we had 12 different Gaussian distributions to compare: 1-3: Single Gaussian Model based on RGB color representation and Sets W, B, WB, 4-6: Single Gaussian Model based on HSV color representation and Sets W, B, WB. 7-9: Single Gaussian Model based on HSL color representation and Sets W, B, WB, 10-12: Mixture Gaussian Model based on RGB, HSV, HSL color representation. 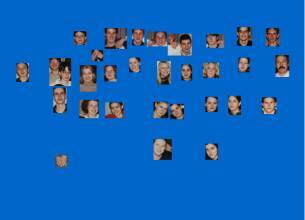 The first step in the processing of an input picture is creating a skin-likehood image. Skin-likehood image is an image in which each pixel corresponds to the probability of occurrence of skin-color (in the same pixel in the original input image). The probability of each pixel is calculated by formula (5). The values of probability can be easily transformed into greyscale values. So skin regions are brighter than the other parts of image. Note: To reduce the effect of noise in an input image is useful to use a low-pass filter. See section 4.3. The second step is creating a skin-segmented image by using a threshold value of probability. If the probability of a pixel in skin-likehood image is more or equal to estimated threshold value, we suppose that this pixel represents skin color. If not, we suppose that this pixel does not represents skin color. 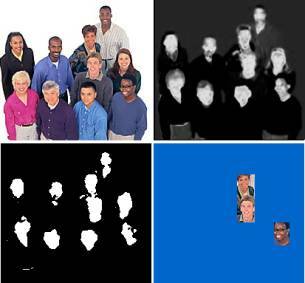 The skin color pixels are white and the other ones are black in skin-segmented image. Estimating a threshold value is very important for next steps of image processing. We can use fixed threshold value for every image or adaptive thresholding. The adaptive thresholding is based on the observation that decreasing the threshold value may intuitively increase the segmented region. We found out that using a fixed threshold value is more efficient in our experiments. However, we implemented both ways of thresholding process in our program and so user can easily choose which one he wants to use. A human face is defined as a closed region in the image, which has 1 or more holes (eye, mouth, etc.) inside it. The ratio of width and height of a human face is not bigger than 3.0. A segmented human face region is not 5 times smaller than the maximal square of all segmented regions that verify Assumptions A and B. The idea of our algorithm for Assumption A is as follows. We are looking for a closed white (skin) region that has one or more black (not-skin) regions inside. In other words, we are looking for a black region that is bounded with a white region. Accordingly, for every pixel of the black region, following rule must be true. If we move from the pixel to the left, to the right, up and down, we should found 4 pixels that are part of the same white region. If is this rule for every pixel of a black region true, it means that this region is bounded by a white region. In other words, the white region has a black hole inside. To make this algorithm more simply and its execution faster, we assume that there is no such white region, that has a black region inside and there are also another one or more white regions inside that black region. With this assumption we can stop searching for a white pixel in that 4 directions as soon as we found first white pixel. We can make this reduction because, we are looking for black holes which results from facial features such a mouth, eyes and there is very low probability that for example inside a human mouth is something that has skin-color. Before we start to find the white regions that has one or more black holes inside, we need to label all white and black regions with an unique label. We used unique colors as labels and 8-connected seed fill algorithm for labelling of all white regions as well as 4-connected seed fill algorithm for all black regions. Assumption B tells that the ratio of width and height of a human face is not bigger than 3.0. Usually the ratio of width and height of a normal human face is smaller, but human faces can have different orientation in a image and sometimes we detect face region as face together with neck. 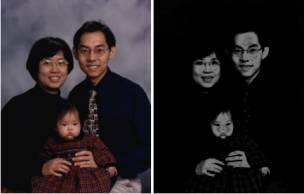 We can see a positive example of an application of Assumption B at Figure 6 where a part of the image has skin-color although it is not a part of human body. Assumption C tells that a segmented human face region is not 5 times smaller than the maximal square of all segmented regions that verify Assumptions A and B. It might happen that applying only Assumption A and B is not enough to segment face regions. For example, hands have skin-color, segmented region of hands can have a hole inside (between fingers) and the ratio of its width and height is not bigger than 3.0. So it verifies Assumptions A and B.� We can see a positive example of an application of Assumption C at Figure 7 where a little region of hands is not included in the result image. The selection of� face regions has usually better results with applying these 3 assumptions as without them. Especially, if the input image is in a good quality and has a portrait character. But sometimes it might happen that on of the assumptions makes a result image wrong. Therefore user can enable or disable applying of any assumptions. Note: There are some recommendations about applying these assumptions in section 4.3. Skin-color models (SG/rgb/W, SG/hsv/W, SG/hsl/W) based on Set W where tested only with images of people having white skin. Skin-color models (SG/rgb/B, SG/hsv/B, SG/hsl/B) based on Set B where tested analogue. The aim of this project was to estimate a skin-color model that would be adaptable for any skin color and so these 6 models were not relevant for further comparision. As shown at Figure 8 the most 5 best skin-color models are: 1. MG/hsv, 2. MG/hsl, 3. SG/rgb/WB, 4. MG/rgb, 5. SG/hsv/WB. The testing set was too small to see objective results, so we will continue the comparision. According that the results of HSV and HSL skin-color models are almost the same, we will ignore the HSL models. According the results from previous section, we will compare following skin-color models: MG/hsv, MG/rgb,� SG/hsv/WB, SG/rgb/WB. We collected 3 new sets of images: Set CAU of 11 images (Caucasians), Set ASI of 9 images (Asians) and Set AFR of 10 images (Africans). As shown at Figure 12 the MG/hsv skin-color model appears to be the best for any skin color. Using mixture Gaussian models is generally more effective than using the single ones, as well as using HSV (or HSL) color representation than RGB. Because of it is allowed to enable or disable mentioned 3 assumptions or pre-filtration in our software, there can be different results for the same input image and skin-color model. In this section, we will analyze some interesting aspects of image processing. The pre-filtration is activated as a default option. As shown at Figure 13 segmented skin regions are more integral if we use low-pass filter to reduce the effect of noise. Using pre-filtration and so making skin segmented regions more integral might be also a disadvantage. For example, if the ratio of squares of image sizes and� maximal segmented skin region is more than 30:1, there need not to be any black hole from a facial feature segmented. Accordingly applying Assumption A, we might ignore some truly skin regions (see Figure 15). So, if the ratio of squares of image sizes and� maximal segmented skin region is more than 30:1, we have two options to optimize the result. First is to disable pre-filtration (see Figure 16), second is to disable Assumption A. The Assumption A is also good to disable, if a face on an input image has side orientation. If we process an image where people have no dress (the neck and upper part of the body), we should disable Assumptions B and C.
If we want to characterize the main difference between using RGB and HSV color representation, we can say that the skin-color models using RGB representation has more variance. In other words, it detects more hues of skin-colors than the HSV one. This aspect can be effectively used in images of faces that have some parts more affected with ambient light. There are cheeks and jaw more lightened than other parts of the face at the Figure 17. Skin-color model MG/rgb segments even the more lightened parts. But as we can see at Figure 18, the MG/hsv model does not. Figure 20 illustrates the duration of this computing. It depends on the sizes of the image, number of segmented regions and square of black holes from facial features. In this paper, we presented a method for the detection of human face in a color mage.� It uses Gaussian models to represent skin-color models. It is evident, both from the histograms of samples and the results, that a Gaussian mixture is more appropriate than a single Gaussian function in estimating the distribution of skin color. We compared evaluation of different color representation and found out that HSV model is better then RGB one. We suggested 3 assumptions to optimize the final result of segmentation and gave recommends about using of them. To improve the quality of estimated skin-color models, we should use significantly larger sets of analyzed samples and EM algorithm to estimate more appropriate values of mixture Gaussian models. The evaluation method of processed images is subjective. We plan to use� a metric based on automatic comparision in our next work. Our experiments resulted in the observation how to get more accurately segmented face regions.� It is based on the fact that the results of images of people having white skin are better, if we use a skin-color model based only on the Set W (analogue by images of people having black skin). So at first, we will use a mixture Gaussian model to get rectangle regions of human face (as in result images at Figures 6, 7, 13, 14, 15,..,19). Second, we will analyze only these regions with a skin-color model based on Set W and� a skin-color model based on Set B separately. Then we will use the one of them which gives bigger average probability of segmented (white) skin regions as the final result. This work was a semester project in the subject Computer Graphics 2 at FIIT STU. I would like to thank my professor Martin �perka for an inspiration, suggestions in the research and help with this paper. Also thanks to colleagues Michal Slamka and Erik �tetina for� math-lab scripts to display histograms (Figure 1) and compute mean vector and covariance matrix of a dataset.